One of the big differences between writing an historical novel, whether or not it contains elements of fantasy, and one set in the contemporary or future world, is the social structure of the principle characters. In historical past, such as when The Exiled Blade is set, the poorer strata of society were largely illiterate and unable to record their circumstances whereas those who could read and write were not interested in recording the circumstances of those they regarded as lesser people. In the last century, when education for all has allowed anyone to record their lives and feelings, there has been a much wider cast for people to write about. And attitudes have changed. In early fifteenth century Venice, the poorer members of society had enough to do just trying to stay alive and find enough money to feed and shelter their families. If anything out of the ordinary happened, it was usually bad. The wealthy, however, could make things happen. Their struggles were political and they rarely thought about those who provided the service that kept them in luxury. Even their servants tended to come from better families. For this reason, most historical novels are set in and around the upper echelons of society – though every reader can probably think of at least one exception. 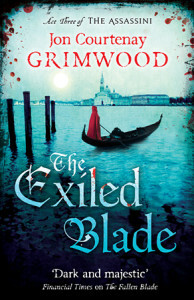 The Venice at the time of this novel, the third in the Assassini trilogy, focuses on those with power and those willing to risk everything for it. The City State at the time was ruled by Alexa Millioni who stands as regent for her, apparently, imbecilic son Marco. Her brother-in-law, Alonso, has tried to find a way to take over. Currently all his plots have so far failed and he agrees to go into exile. Officially he is going to strengthen Venice’s mainland concerns. Before he goes he marries. Internal plotting is not the only thing that Venice has to contend with. Because of its position and its access to trade routes it is coveted by both Sigismund, the Holy Roman Emperor and the Basilius, ruler of the Byzantine Empire. If they cannot get what they want by marriage to Giulietta, widow of Prince Leopold (Sigismund’s illegitimate son), then they will take Venice by force. Sigismund’s forces under Frederik, Leopold’s brother, camp on the mainland to the south, the Byzantines plan a sea attack. To complicate matters further, the weather changes and the country finds itself in the grip of the coldest, longest winter in living memory. Even the canals freeze. If this were not enough, Alonso has made an alliance with the war-like Red Crucifers and has his strategy for bringing down Alexa and Venice into his own hands. The relationship between Giulietta and Tycho, a trained assassin and a youth handicapped by his aversion to sunlight, is abruptly changed when her son, Leo, is snatched. It is quickly clear that this is the work of Alonso who intends to claim the child as his own son. Tycho vows to bring the boy back or die trying. This series qualifies as fantasy rather than just being an historical novel because Leopold and his brother Frederik are kreighund able to transform into wolves at will and as such are valuable on the battlefield. Before his death (in volume One, The Fallen Blade), Leopold made Leo his heir in all things, including being kreighund. Although the word is not used, Tycho’s nature will be recognised by most readers as vampire. A trilogy like this is based very closely on historical fact and will appeal to readers of historical and fantasy novels alike, as well as anyone who wants action, characterisation and good writing.